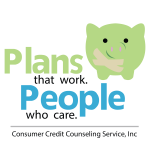 Consumer Credit Counseling Service, Inc. is committed to assuring the privacy of individuals and/or families who have contacted us for assistance. We assure you that all information shared both orally and in writing will be managed within legal and ethical considerations. Your ‘personal financial information’, such as your total debt information, income, living expenses, and personal information concerning your financial circumstances, will be provided to creditors and, possibly others with your specific authorization. 4. We may disclose all of the information that we collect, as described below, to creditors and related financial institutions who need this information in order to put you on a Debt Management Program (DMP).